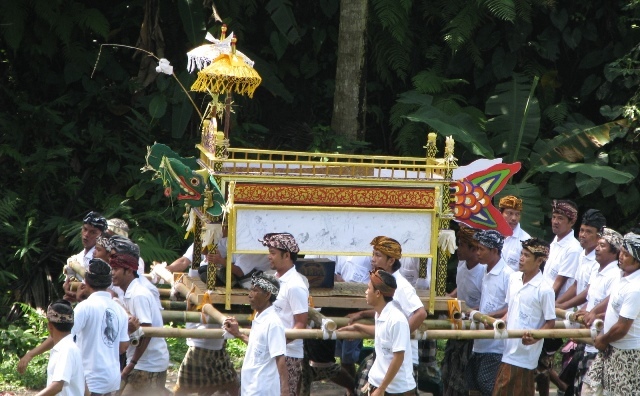 Famous for its painter's community, Ubud is special in more ways than one. 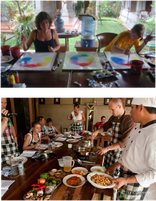 It has its own magic, and its particularly beautiful surroundings and gracious way of life have drawn celebrities and artists from all over the world in recent decades; some have even adopted Ubud as their own home. 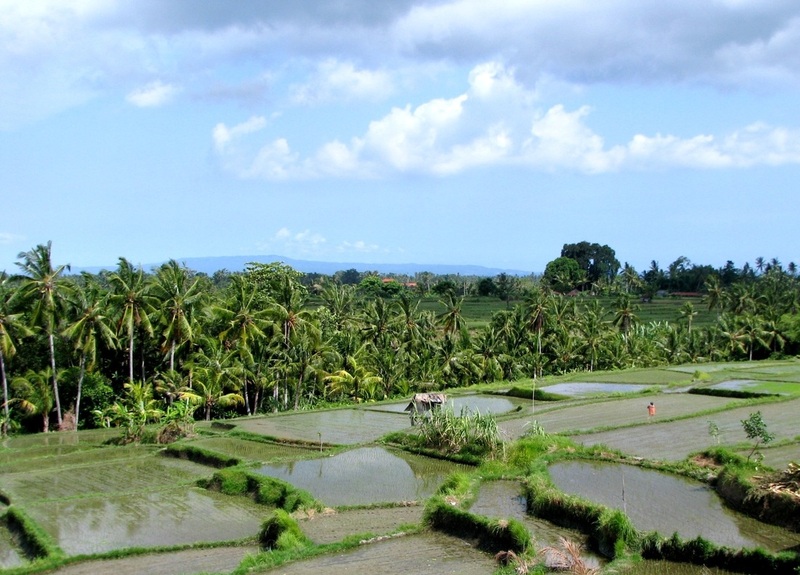 If I have to describe Ubud Bali in one word I would say "idyllic". 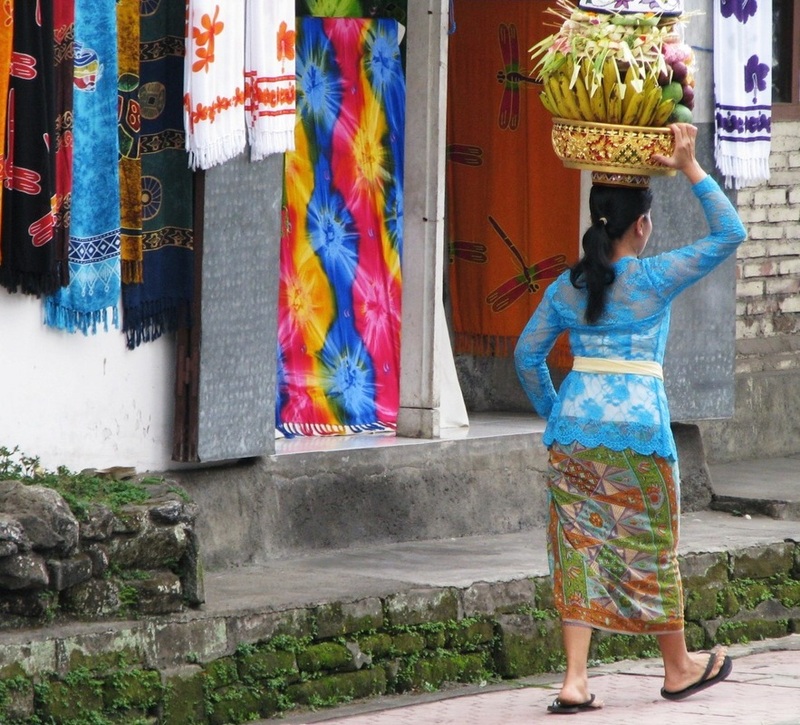 Despite the large numbers of tourists visiting this little village with streets that are too narrow for touring buses, Ubud has been able to maintain its traditional life. It is the meditation capital of Bali, many people come here purely to recharge their batteries from the past paced western life, here you just surrender to the energies and let go. Ubud has been voted the top city in SE Asia in January 2010 by the Condé Nast Traveler, it is not hard to see why; everywhere you look is paradise with dense verdant green jungles, myriads of rice fields and beautiful tropical gardens. 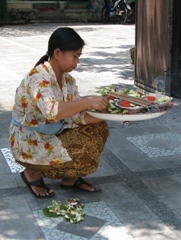 Here Balinese men and women still place offerings gracefully on the side of the road and on temples; every day you will see them riding beautifully dressed on motor scooters to temples and ceremonies while holding colourful woven baskets, sometimes you can witness even a whole family on a bike. This is not a village where you should be up and running...the order of the day is to RELAX and live in the NOW. It is more a place where you'll want to stroll around or just sit with a book and watch the colourful and delightful pictures pass by. If you can’t resist some action though, there is the Monkey Forest where you’ll be greeted by the many Macaque monkeys, they are quite friendly but please do not touch them or smile as they take this as a sign of aggression and will bite you. 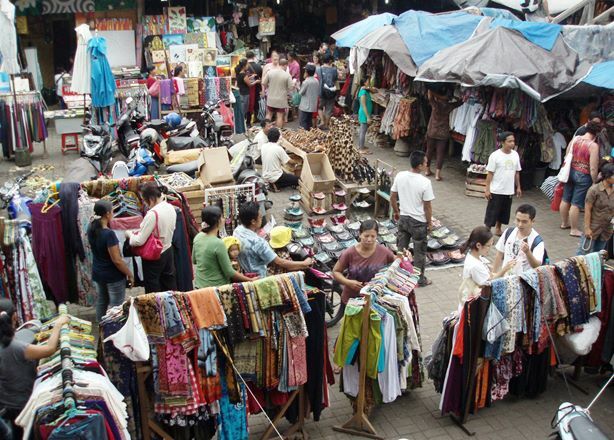 It's a must to visit Ubud markets which is a maze of shops that sell everything a traveller in Bali can imagine…and more, but bargain hard. 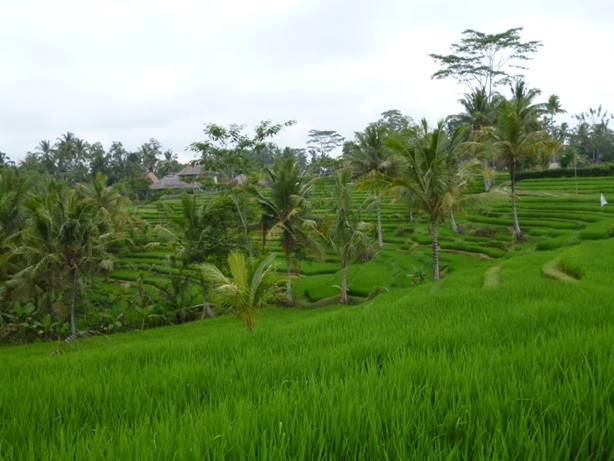 The village is surrounded by fertile land which has resulted in the beautiful rice field terraces, especially in Tegallang where you always find in travel and photo books on Bali. This is also an ideal location to explore the terraces yourself and take beautiful pictures while standing in the middle of the fields. In the past the rice fields and ideal irrigation systems have provided the people with a surplus in rice yields. With time to spare the king of Sukawati ordered the rice farmers to dedicate their time on paintings for temples and palaces. Ubud is an ideal place to walk around, especially if you check out the small streets and alleys on the side of every road. 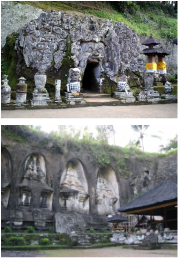 They lead you to amazing places such as rice fields, river valleys, temples and Balinese living court yards. 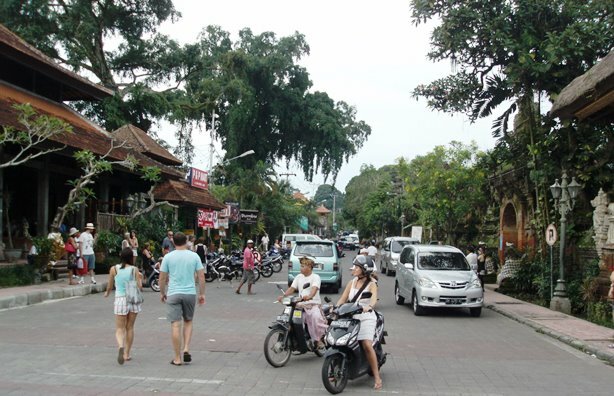 Ubud Bali has three big main roads which are all one way-streets. So you will definitely drive through them regularly if you are finding your way through Ubud by car, bike or motor scooter. The busiest and one of the longest is the Monkey Forest Road. This road starts in the south when you come into Ubud and ends all the way in the north at the crowded Ubud Market. This street has many shops, restaurants and places to stay. The many alleys (gang) on both sides of the road are passages to tucked away hotels (many cheap homestays), spas and restaurants. 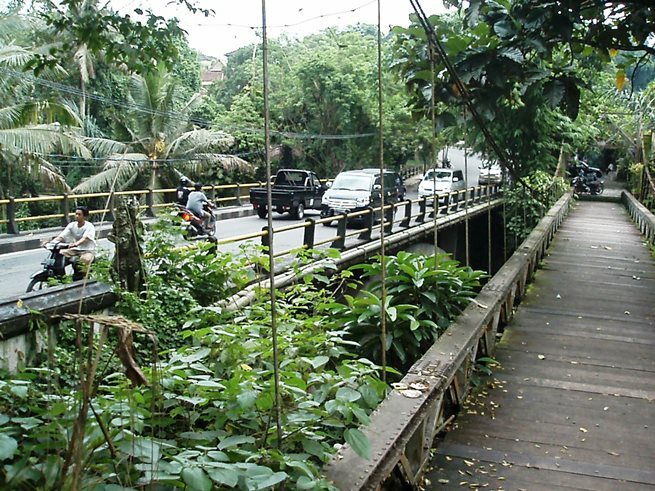 Jalan Raya Ubud is a road that crosses Monkey Forest Road in the center of Ubud Bali. To the left, this road leads you to the Campuhan area. Within these sacred grounds you can start a rice field walk that goes on further north of Ubud to the ancient-looking villa complex Ibah. Another road that you’ll certainly come across is Jalan Hanoman. Like Monkey Forest Road, this street is long and it has many restaurants, hotels and homestays, it is also filled with funky little shops. Going towards Monkey Forest Rd, Jalan Hanoman comes to a fork, the right veers off to Monkey Forest Rd, whilst to the left is still Jalan Hanoman and goes on passing the ARMA museum then becomes Jalan Raya Pengosekan that takes you on to Lutundoh village. 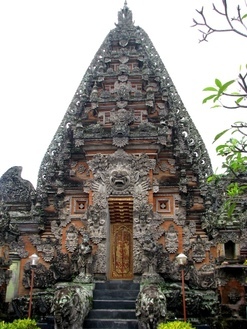 Ubud is relatively small so if you have the time you can easily walk around and see a lot. The streets and footpaths are a little bumpy, occasionally you might find a hole or two or a loose pavement so be careful (Hati Hati) of your footing. However look out for the colourful offerings which are placed along the streets and in front of shops. 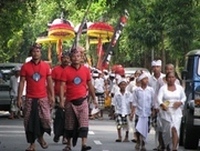 You can easily crush them with your feet while window shopping which is insulting to the Balinese. Along Monkey Forest Road there are many bicycle and motor scooter rentals, usually the price drops the longer you rent them. Before you hop on, check the profile of the tyres are still good. It can get really slippery when it rains. An accident is the last thing you need during your well-deserved holidays. Everywhere in town you will find many private drivers sitting in the shade of a tree only to jump up when you come in sight. Instantly they will make this driving movement with their hands and at the same time wiggle a little with their body. ‘Transportation...?’ is the first thing they say. If you reply with: ‘No thank you...’ ot 'Tidak Teramikasi' (pronounced as 'tear out my car seat'), you can immediately expect the next question ‘How about tomorrow...yes?’ They are harmless but can get on your nerves after passing dozen of them within minutes. But if you are considering touring around for a day then a private driver is what you need. Check out if you like their car and then bargain for a price that suits you. Usually it is around Rp.500,000 per day (8 hours) including a chatty driver and fuel. The Ubud Clinic, 24H (0361-974911) can be found on the west-side of Jalan Raya before the Campuhan bridge and here bilingual staff are also available. 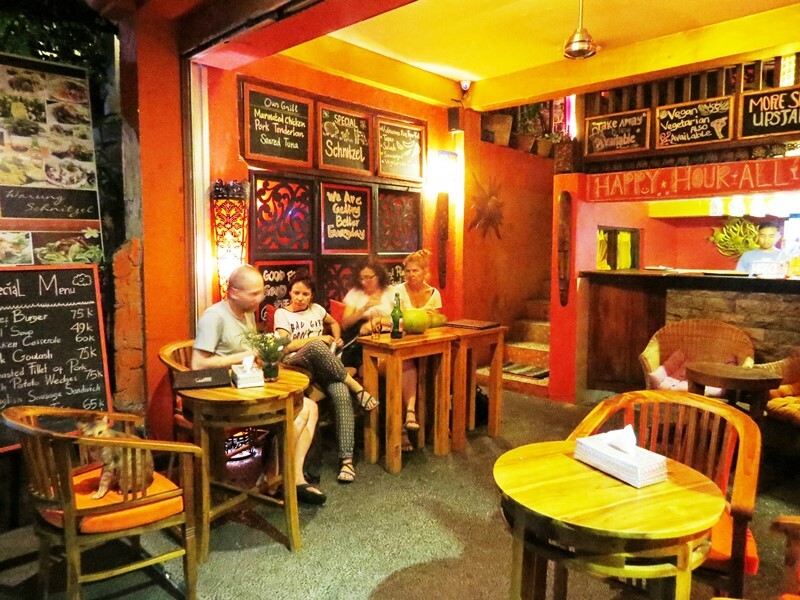 Ubud is full of all types of restaurants and cafes. After just a couple of meters you will bump into one again. So no chance of getting hungry here... There is a mixed choice of restaurants such as the classy modern looking restaurants, restaurants that only serve organic food and drinks or restaurants that have a gorgeous garden where you can sit on a big pillow on the floor. But there are also the basic ones (but always with some nice decoration) that just offer you what you're looking for good food. 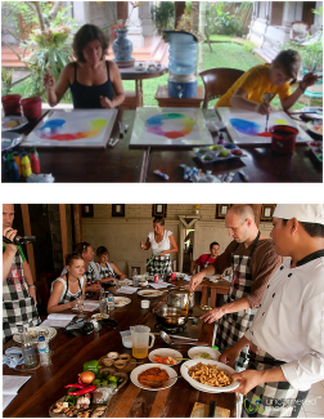 Below is a list of recommended Restaurants & cafes; it gives you at taste of what you can find in Ubud. Image opposite is Warung Schnitzel. NOTE: When visiting temples be aware that you should wear long pants or a sarong with a selendang tied around the waist (men and women). Whilst you can take your own every major temple has selendangs to borrow for a small donation. It is extremely bad form (in fact it’s taboo) for women who are menstruating to enter a temple.